Originally, this wardrobe was one of a pair, and was topped by a chest for the storage of headdresses. The vast proportions of the palace rooms explain the monumental aspect of the whole piece of furniture, over three meters high. Its decoration depicts dragons imperial symbols looming like spirits in a kind of magic mirror. The features of the snake like dragons, as well as the tight composition are representative of the Wanli style. The lacquerworker has skillfully varied his decoration according to the position of the panels: intimate, freely-composed pastoral motifs on the back, an intermediary covering decor on the sides, and solemn, hieratic symbols on the front. The panels are held in place by uprights-beams cut out of a single piece of wood and are composed of several dovetailed planks reinforced with recessed crosspieces. Each door has a half-motif for the lock. The wood was prepared and covered in fabric, after which several coats of black lacquer were applied. These were successively dried, sanded, and then polished to achieve a perfectly smooth ground. 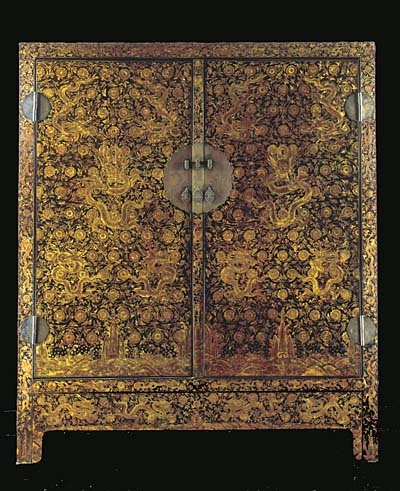 Originally, the various golds, now half worn away, were briskly painted onto a red preparation fixed on the black ground using a technique extremely widespread under the emperor Wanli, each coat being in its turn sanded and polished. Given its impressive size and lavish decoration, it would appear that this piece of furniture stood in one of the rooms of the imperial palace. Wardrobes were key items in Chinese dwellings and their formal simplicity inevitably reflects their prime function as storage elements with interior shelves and occasional drawers. With its high quality workmanship and painstaking attention to detail, this wardrobe is an outstanding piece of furniture that reflects the luxurious taste of the Ming court.